Regularly featuring in Best Bar this, and International Coolspot that, Bramble Bar finally have a website to be proud of. Integrated cocktail menu, blog, galleries, music! And how cool is that animation at the start? Looking lover-ly, functionally stunning, and now content-managed...this site rocks! 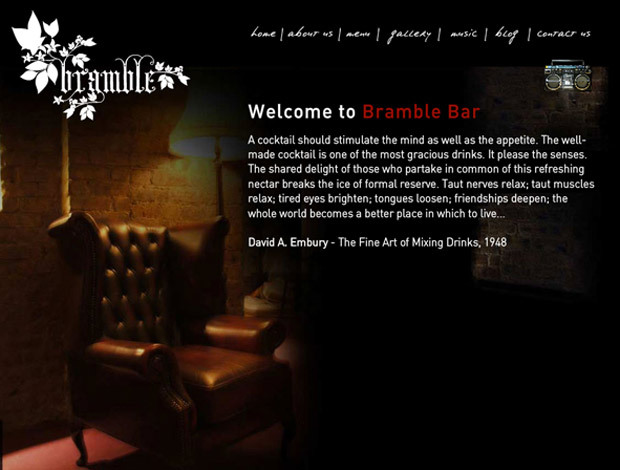 Stop in for a cocktail at Bramble Bar: 16A Queen Street, Edinburgh. And try the latest venue The Saint: 44 Saint Stephen Street, Stockbridge, Edinburgh.